There is something I have difficulty understanding. You, who have put an end to 95 years of “there are no Kurds, they’re just Turks who wander around the mountains” lying policies by the state on the Kurds; who have removed the military’s guardianship over politics, the same military that since the beginning of this Republic has decided who lived and who died and that initiated coups at the drop of a hat. How is it that you who have made such important inroads into this democracy can insist on continuing the 95 years of denialist policies when it comes to the subject of 1915? All of us believed that when you signed those protocols with Armenia in October 2009, the 95 years of lies surrounding 1915 were coming to an end just as they had on the Kurdish issue. Could it be that when you signed those Protocols you believed that you were going to come to a resolution continuing the 95 year old policies of denial? Doesn’t seem possible….Could you have found a way out of the Kurdish problem by continuing to insist that “There are no Kurds, they’re just Turks who wander around mountains”? 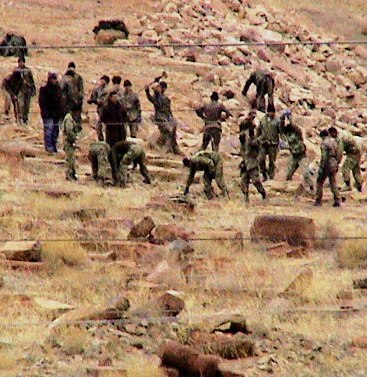 If you had stayed loyal to the logic of the problem solving methods of the Military when it comes to the Kurds, whereby they were equated with terrorist organizations, treating the Kurds as “nails” and themselves as the “hammer”, would you have found a way out of the impasse? Well, it seems to appear that you seriously think you are going to find a resolution to the Armenian problem by continuing the 95 year old lie. Anyone opposing this view on the Armenian issue is the “nail” and you are the “hammer”….trying to intimidate the US, posturing like a bully…is this how you’re going to remove a 95 year old gangrene? Mr. Prime Minister and Mr. Arınç, if it could have been fixed this way, don’t you think it would have been, long ago? Heck, who even needs you then…Şükrü Elekdağ would have fixed it; Veli Küçük would have found a neat solution…right? 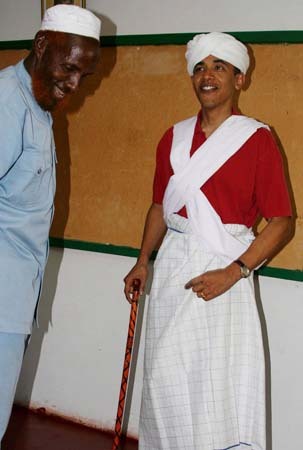 So, what happens if tomorrow Obama decides it’s time to call your bluff and gives you a taste of your own medicine. What if he comes out with a statement saying “You want to shut me up or get me to tell a lie by threatening me! You’re trying to force me to deny what I believe to be true with threats! Shame on you! Aren’t you the slightest bit embarrassed to be threatening me like that? I’m not lying any more….I am going to state what I believe about 1915. It was genocide”. What are you going to do then? When the protocols were signed in Switzerland, we believed that it marked the end of 95 years of the policies of lies and that it was the death knell for the Gündüz Aktan, Şükrü Elekdağ and Yusuf Halaçoğlu era. Not only was the border going to be opened, but commissions devoted to making recommendations on how to resolve the issues stemming from history were going to be established. It seems likely that while Switzerland was mediating the agreement, it tried to convince both you and Armenia by pointing to the “Bergier Commission” which it had established in 1996, as an example of a “Commission of Independent Experts”. This commission had been formed to research the role that Switzerland had played in the Jewish Holocaust. After five years of work, it presented a final report in 2001 but during those five years, 25 research papers were published covering almost 11,000 pages of information. There is a fact that is even more important than this however. One year before the commission was formed, in 1995, the Swiss government apologized to all Jews in the world for its policies during the Second World War. In actuality the commission was formed as a result of that apology. There is no possible way that you could not have known that one of the conditions for the establishment of the commission was an apology to the Jews. Even if the Swiss hadn’t mentioned it to you, it was a well known fact and we believed that you signed the protocols with full knowledge of this, and heralded the beginning of change in 95 years of the policy of denial…. “an apology to the Armenians is on its way” so we thought. Apparently that wasn’t the case; instead you had some “oriental inscrutability” in the works. You were going to continue the 95 year old policy of denial while fabricating a resolution to the problems that have plagued our relationship with Armenia. This is hard to believe but it is apparent from everything that you have done thus far. Mr. Prime Minister and Mr. Arınç, I ask that you put this bit of information somewhere in the corner of your minds: you will never resolve the problem of 1915 by repeating a lie that’s been memorized over 95 years. If it could have been resolved by rote repetition, there were those before you, who were much louder, who would have achieved it. A black stain was smeared on the brow of the Turkish nation in 1915. The ones who did this were the Unionist murderers. If you don’t identify that stain and if you don’t put some distance between yourselves and those who placed that stain upon the brow of the Turkish nation, you won’t be able to take a single step forward on this issue. Don’t even bother trying. You are the ones who have changed the traditional line that’s been followed on the Kurdish question, who have fought to push the military out of political life. Why are you parroting the same 95 year old lies that have been told by this military and this bureaucracy? Let me give you an example. You weren’t able to make any progress on the Kurdish and military matter by siding with the ones who called those involved in the Şemdinli event “one of our boys”. You were only able to make progress after so many painful experiences, once you put distance between those “good boys” and yourselves. The subject of 1915 is no different. “Our boys” are the ones who continue to deny that Armenians were annihilated in 1915! They’re the ones forming the Talat Pasha Committees and organizing the memorial meetings for Kemal, the murderous Mayor of Boğazlayan. And let’s not forget, they are the same ones who have planned assassinations against you and have tried to overthrow your administration…Don’t you realize that you will never be able to solve anything regarding 1915 by holding onto the same position of those who want to dig your graves? Mr. Prime Minister and Mr. Arınç, the answers to the problems that are the legacy of 1915 can’t be found in the denialist policies of Veli Küçük, Doğu Perinçek, Şükrü Elekdağ and Yusuf Halaçoğlu. Don’t search for the answers there. You won’t get anywhere repeating the chorus they’ve been singing for 95 years. They are your adversaries on the issue of 1915, just as they are when it comes to the Kurdish issue and the issue of the military’s place in politics. You cannot construct your response to 1915 by holding rank with those who want to drag the country into chaos; who murdered Hrant Dink, who have planned massacres against Christians and who have been plotting coups against you. If you are going to respond to 1915, you need to search for that answer in a place that is different than the answers given by Ergenekon or by the ones who plotted the coups. For this you should follow your Moslem roots in Anatolia that have risen alongside your party and take a closer look at what these roots did during 1915. Mr. Arınç, these words are for you. With reason, you were angered by the way the women of CHP in Mersin tore up the Muslim veil  Do you realize, however, that with the position that you have taken you have torn the deep fabric of Anatolian Islam, have ripped apart the cultural legacy of Anatolian Moslems who can walk head held high for bravely challenging the murders of 1915? Do you know that when the Unionist gangs were murdering Armenians in 1915, the ones who put up the biggest fight, who challenged them the most were the Moslems of Anatolia? Did you have any idea that it was the Moslem community of Kastamonu that marched upon the Governor’s office demanding “we won’t stand for our neighbors being murdered”? Or that it was the Moslems of Yozgat who opposed Killer Kemal of Boğazlayan yelling “there’s no place in the Koran for the murder of innocents!”? Have you never heard of the important role played in the hanging of Killer Kemal by the written testimony of the Grand Mufti of Boğazlayan, Abdullahzade Mehmed? Did you know that in opposing the murders being committed by Killer Kemal, this Moslem Mufti said “Allah stands above us all. I fear his wrath”? Mr. Arınç, are you aware of the order given by Commander Kamil Pasha of the Third Army in 1915? He stated “Who ever tries to hide Armenians in their homes will be executed before his front door and his home will be burned to the ground.” Despite this order, do you know that Haji Halil, a Moslem from Urfa, hid an Armenian family of eight in the attic of his home, in the market of Urfa for one full year despite the threats of death and burning? Go to Eastern Anatolia and ask the members of parliament from your own party. They’ll tell you dozens, hundreds of stories like this. Mr. Arınç, you can’t build a future on the backs of murderers. You can build a future on the backs of those righteous Moslems in Anatolia who challenged the murderers. In the same way that you can’t resolve today’s problems by supporting Hrant’s murderers, the “Samats” and the “Veli Küçüks”, you won’t get anywhere supporting the murderers of the Hrants of the past. The answers to 1915 can’t be found in the answers of Doğu Perinçek or Veli Küçük. They are members of the Ergenekon gang that killed Hrant Dink; it’s natural that they defend the murderers of the Hrants of the past. Let the “Veli Küçüks” defend the murderer Samat of today and the murderers Talat, Enver and Kemal of yesterday. Your place is not at the side of Veli Küçük. Your duty is to stand by the side of the “Haji Halils”, to stand up for those Moslems who put themselves and their families at risk opposing the massacres. We need the honest and honorable cry of Turkishness and Islam. Let Doğu Perinçek, Veli Küçük and the ones who planned your assassination defend the murderers of yesterday and today. You need to see by now that the ones who defended Talat, Enver and Dr. Nazım in the past are the same people who defend Oğün Samat today. If we can walk with a shred of self-respect today, head held high, it’s because we can point to Hrant’s killer and call him what he is. You need to see that once we acknowledge the murderers of the Hrants of 1915, we will walk with our heads held high, self-respect intact. Nazim Hikmet has the best words for describing what needs to be done in connection with 1915. I’d like to conclude this letter with him. Mr. Prime Minister, I know that you like to read poetry. The Turkish person and the Moslems of the Middle East want to hear these verses from you! This references an incident where a book store in a Kurdish city was bombed. Officers in the Turkish military were suspected of having planned and/or executed the deed. The Chief of the General Staff was quoted as saying the officers were “our good boys”. This is in reference to an incident during “International Women’s Day” where women members of the CHP (Republican People’s Party) tore up the headscarf of a Moslem woman. Concerned about the “historical commission” in the Armenian-Turkish protocols that may investigate the veracity of the Armenian Genocide? You should be if you are an idealist who believes that patently obvious facts should not have to be proven again and again. For many, this endeavor is as impossible – if not as pointless – as it is to enlighten someone who intransigently insists that the sun orbits around the earth, despite that fact that science proved the opposite centuries ago. That being said, I never want to give up on someone who genuinely seeks the truth. The most damning evidence that shows that Turkey carried out genocide against the Armenians is a comparative analysis with the Arab Revolt. Just as a reminder, during WWI many Arabs openly sided with the British. They were resentful of heavy-handed Turkish rule, and wanted to be independent. As with most nationalist movements, this revolt initially started on a smaller scale, and ultimately mushroomed into full-scale warfare between Ottoman Turkish forces and Arabs. As indicated by the outcome, the Arab revolt was every bit as dangerous to the Ottoman Empire as was the so-called “Armenian Revolt.” Yet, in the end the Ottoman Empire did not target Arab civilians as it did Armenian civilians. While Arab lands were still under Ottoman control, Arab residents of Damascus, Aleppo, etc were not exiled into the wasteland without food, water or shelter. Instead the Empire, for the most part, restricted its violence to actual Arab militias. Certainly, skeptical readers might say, the Arab Revolt originated in the uncontrollable and wild Arab Peninsula, not domesticated Damascus. But, this same skepticism can and should be applied to the Armenian case as well. Even the most fanatical Turkish apologist will not claim that the alleged “Armenian Revolt” existed in Bursa, Konya, etc., yet the Armenians of these Anatolian cities were nevertheless marched into the desert and slaughtered en masse. So what possible conclusion can be drawn from the comparison? The Ottoman government’s policy regarding the Armenians was not just some necessary wartime contingency. Some denialist historians might say that the Ottoman Empire was ultimately willing to lose the Arabian lands. Arabia was not vital to the empire’s existence, and its loss did not represent and existential threat. Turks did not live there in significant numbers, and they were more overseers than anything else. Conversely, these historians will claim the same is not true in the Armenian case, and that Anatolia is the heartland of the ethnic Turks. Had Armenians carved out an independent country there, or so the denialist argument goes, the existence of the Turkish people would be threatened. But this argument is not valid either. Eastern Anatolia at the time was an ethnic mosaic, and rarely did Turks constitute an outright majority. In fact, in many places such as Bitlis, Armenians were the largest ethnic group followed by the Kurds. Here and in other places in the region, Turks were actually only a small minority. Therefore, the same demographic argument that says Arabia wasn’t important to Turkey also applies to Eastern Anatolia. To this, a denialist historian might answer, demographic reality is not as important as the perception of Turks. But again, Eastern Anatolia does not feature prominently in the hearts or lore of Turks (even till this day), with one minor exception being Alp Arslan and his battle at Manzikert in the 11th century. Instead, Eastern Anatolia has always been more like a colony, such as the Balkans, than an integral part Turkish identity. The real homeland, the real gem, to Turks at the time of WWI is further west where the Ottoman Empire actually originated, places like Eskisehir.Therefore, fear of losing Eastern-Anatolia as opposed to Arabian lands is not a justification for Ottoman policies vis-à-vis the Armenians, especially when considering that the Levant is just as close to the heart of Turkish identity, western-Anatolia, as is Eastern-Anatolia. In conclusion, the Ottoman Empire’s brutal treatment of the Armenians, even if they were in full revolt (which they weren’t), was reserved for Armenians alone, despite other rebellions in the Empire. It is now incumbent on denialist historians to explain the huge differences in policy with respect to an identical security threat. All this being said, severe annoyance with this “commission” is justified, because denialists are most likely not really looking to debate the veracity of the Armenian Genocide, but instead are mainly interested in the mere illusion of controversy. P.S. There is no rule that says that genocide cannot occur simultaneously with war and rebellion, as Armenian Genocide deniers would mistakenly have you believe. If anything, a genocide that occurs without the backdrop of rebellion, even rebellion committed by the victim group, represents an anomaly. I am going to give just three examples of genocides coinciding with rebellion, though many more cases exist. The Rwandan Genocide of the Tutsi people coincided with the Tutsi RPF rebellion in the same country; the Herero Genocide coincided with a rebellion in German South-West Africa by the Herero; lastly the Genocide in Darfur which coincided with the JEM rebellion in Sudan. If you were to apply the same (rebellion = no genocide) argument that denialists use against the Armenian Genocide, you would have to deny every other genocide in history. It all began when I was cutting an Orange for my niece when she asked me why the name Orange is both a color and a fruit. After doing some research, I discovered that the root of the word Orange in the English language is derived from the fruit. In other words the Etymology of the color and the fruit is interconnected. No one can argue that the fruit Orange is not Orange. As someone who has studied the Armenian Genocide over a number of years, I could not help but familiarize myself with the etymology of the word Genocide. I discovered that the word genocide is from the roots genos (Greek for family, tribe, race, a people, a nation) and –cide (Latin – occidere or cideo – to Massacre, Kill, exterminate). I looked up the word in the Oxford dictionary and found the definition to be “the extermination of a race”. I then recalled that this definition of the word ‘genocide’ had been used by contemporary eyewitnesses, diplomats, historians, journalists to describe what was happening to the Armenians during WWI. Lord James Bryce in 1915 called it “the Extermination of a Race” in a New York Times article. If the word ‘genocide’ had been coined before WWI, then that one word would have been used, instead of the five words which mean the same thing. I searched online to learn which countries had actually signed and ratified the Genocide Convention. I discovered that most countries in the world had done so, including the United States, Great Britain, Turkey, Israel and so on. I concluded that by ratifying the convention they had in fact recognized that the Armenian holocaust was in fact a genocide. Yes, I use the word ‘holocaust’ because that word was used to describe what was happening to the Armenians during the Abdul Hamid Massacres, Adana Massacres and the Armenian genocide by contemporary writers. William Walker Rockwell in an article titled “the Total of Armenian and Syrian Dead” in the New York Times Current History February 1916, wrote “If the ghosts of the Christian civilians who have perished miserably in Turkey since the commencement of the great holocaust should march down Fifth Avenue twenty abreast there might be a million of them … for most of them will be women and children”. The Armenian genocide has been recognized by the majority of the nations of the world and we didn’t even know it. If those countries who have ratified the genocide convention deny that the Armenians were victims of genocide, then they should either terminate their participation to the convention, or have the convention change the word ‘genocide’ to something else which is not intrinsically connected to the Armenian slaughter. Denying that Armenians were victims of genocide is akin to denying that an Orange is Orange. It is insane and illogical. For those who believe that what happened to the Armenians should not be termed a ‘genocide’, should have convinced Raphael Lemkin not to base the word on what had happened to the Armenians. Unfortunately for them, it is too late, by signing the genocide convention; most of the world has already recognized the Armenian genocide. I’m preparing to watch the program for myself, but given this much prior information, I have to ask. If you are going to cover the epidemic of genocide, starting with the campaign to criminalize genocide, continue to show the struggle so many have endured to (as you titled your program) “SCREAM BLOODY MURDER” while the world turned a deaf ear only to allow genocide to continue around the world, shouldn’t you be talking about the biggest cover up of genocide, the very one which inspired Lemkin to coin the word, the very one which also inspired Adolf Hitler to follow through with the Holocaust? Afterall, it’s this denial that scares CNN from ever using the word “Genocide” in their reporting on related matters. I had been feeling hopeful about the documentary and might have given it more of a pass on this omition until I saw this interactive map on the section of Scream Bloody Murder section of CNN’s website about the world’s killing fields. It appears that despite the fact when it had first been announced Armenia was prominently mentioned as one of the examples of genocide that would be covered, it was overlooked as being pinpointed on the interactive map as an example of genocide. The full post is available at Global Voices Online. Although the vast majority of the West knows about, and acknowledges the fact that Ottoman Turkey committed the world’s first* genocide in 1915, there still remains a small cadre of individuals who desperately try and convince people otherwise. Usually, they will attempt to do so by demonizing Armenians, in essence arguing that they deserved it, or else they will claim the deaths were unintentional. However, a few Turkish agents try and use numbers to convince the uninformed reader that there was no genocide. These propagandists understand that those who use numbers often have reputations of being rational and objective, and are therefore more likely to be listened to if they do the same. In any case, it’s high time to obliterate this so-called argument by using rather elementary math. Wikipedia states that there are between nine and ten million Armenians alive today. For the purpose of this exercise, let’s just agree on 9.5 million. Most scholars, including Turkish and Armenian historians, agree that there were around three million Armenians in the world before 1915. Using this number one can calculate the growth rate needed to arrive at today’s figures. One set of calculations can use the communal violence theory where only 400,000 Armenians died, and the other set of calculations will use the figure that 1.2 million Armenians died in an actual genocide. Therefore, the initial population figures in 1916 are 2.6 million and 1.8 million respectively. With these numbers, one can use the equation T=Pe^(rt) to find the average growth rate, where T=today’s number, P=past number, t=time in years, and r=average annual growth rate. As compared the the CIA Factbook’s .88% growth rate for the US, a 1.8% growth rate for Armenians is quick, but not abnormally so, because there are numerous counties whose growth rate is, in fact, much higher than 1.8%. For example, according to the CIA Factbook lists Bangladesh’s growth rate at over 2% per year. Therefore, without any miracle, which Genocide deniers claim is necessary, the existence of a genocide can still allow for the present population of Armenians. Nevertheless, it is likely that that even a 1.8% annual growth rate is higher than the actual rate, because many present day Armenians counted in the total number of 9.5 million, are 3/4, 1/2, 1/4 Armenian. Let’s then make a reasonable assumption that of the 9.5 million Armenians, that 1.5 million are half (assuming the 3/4 and 1/4 armenians counter balance and average to 1/2 as well). Reasoning that a population will grow twice as quickly if that entire populatioin breeds with external populations, one can logically divide the 1.5 mil figure in half to .75 mill. So the adjusted Armentian population today is actually 8.75 million. With this corrected number, the new post genocide annual growth rate via the T=Pe^(rt) equation, is 1.7%. A 1.7% growth rate is not unreasonable by any means, the US itself held similar growth rates earlier in the 20th cenury, and many 2nd world countries have this growth rate today. Lastly, one can also make the unscientific observation that immigrant families often have larger families than native ones, and most Armenians outside the Republic of Armenia are immigrants themselves, or decended from them. In conclusion, Armenian Genocide deniers should continue to use this denial tactic, because it makes them look ridiculous and ignorant. *The Herero may have this title. 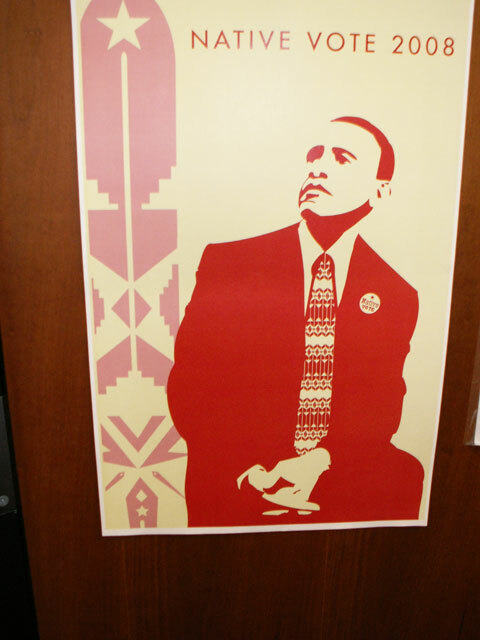 Image: A poster on University of Colorado Denver Professor Glenn Morris’ door. While Native Americans are United States citizens, they are also considered part of the Fourth World – the Earth’s often invisible indigenous peoples. In a way, Native Americans don’t have much voice in the United States. That’s largely because the “one person, one vote” form of democracy doesn’t always adequately reflect the ideas of the aboriginal people who didn’t really give consent to become part of the United States. But in 2008, Native America seems excited about the US elections more than ever. 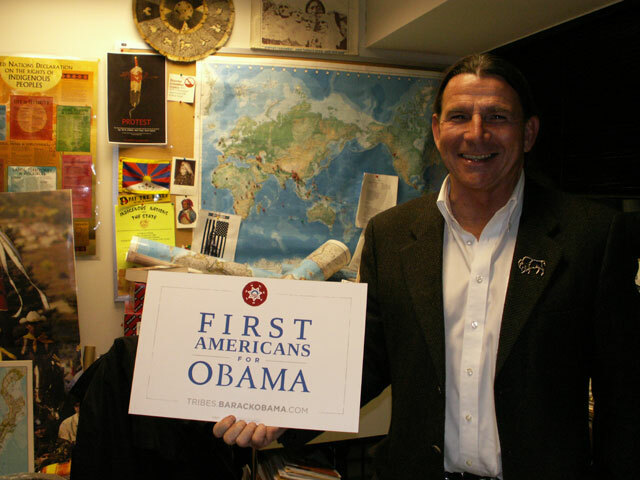 I interview Prof. Glenn Morris, a long-time American Indian Movement (AIM) activist and director of the Fourth World Center at the University of Colorado Denver a day after the election. Morris, who received his law degree from Harvard several years before president-elect Barack Obama did, seems cautiously excited about the next leader of the United States. The indigenous professor says he is happy that he has been proven wrong about his prediction that racism wouldn’t let Obama get elected. He’s worried, though, about false perception of overcoming racism. “My concern has been the tendency to suggest that Obama’s election demonstrates a post-racial era. The danger of defining race as black and white allows the United States to ignore the country’s original sin – the Doctrine of Discovery.” Morris says that racism will be prevalent until the country “looks at the foundational injustice in the creation” of the United States, with a reference to the genocide against Native Americans. The professor says that there are different Indian voices in the elections. But the Navajo nation, explains Morris, had a role in delivering Mexico (and almost Arizona) for Obama. And while the restless activist says he’s excited about Obama’s idea to have a presidential adviser on Native American issues, he hopes that “Native participation will translate into policy.” In Canada, for instance, the federal government often makes decisions affecting aboriginal communities by consulting with First Nations. Morris thinks that consent, not consultation, should be the level of such communication.